Rocks, lots of rocks, railroad rocks! 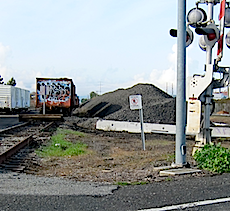 Along the railroad tracks that parallel Chilco Street in Menlo Park is a large supply of rocks – railroad ballast to be precise. About a year ago, Caltrain announced that it would begin receiving railroad ballast at the site which it would use for ongoing maintenance and future construction projects. We’re figuring this Santa – spotted near the San Mateo Dr. bike bridge – flew into Menlo from Hawaii. He’s clearly a more tropical dude than the North Pole’s St. Nick. Who needs reindeer when you have pink flamingos?